Here’s a screen shot of the progress I’ve made on the Sketchup. You’ll notice I have spare lumber pieces next to the house. I found it easier to copy and paste boards that were already oriented the way I want them. One caveat is that you ought to measure your trailer before cutting boards. An inch here, an inch there, and everything could get off. 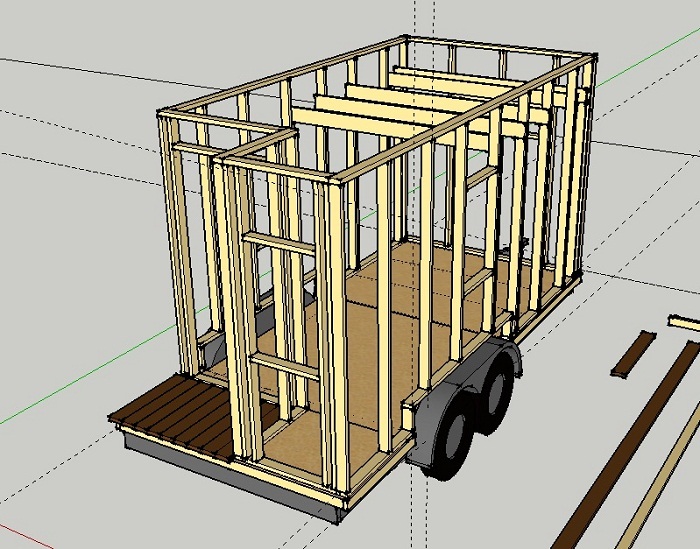 This entry was posted in Planning and tagged framing, SketchUp drawings, tiny house. Bookmark the permalink. The house drawing is looking great! Might want to noodle over the support over the wheels. The porch floor should also be lower than the interior floor to prevent rain water from spilling inside. I made some quick edits to the sketchup file and will email to you directly. Thanks, Michael. I’ll definitely do those changes for next time.